At the moment, the Australian Natural Resource Management (NRM) community is in the midst of responding to the Regional Land Partnerships for their next five years of funding, and we’re supporting our NRM clients with both future proposals, spatial analysis and helping develop the proposals themselves. Apart from actually helping the several of the NRM organisations in developing their Regional Land Partnership responses, we’re supporting them with a range of additional spatial analyses for their bids, using the data that is available from the Department of Environment’s interactive maps. What percentage of the NRM region is covered by that species distribution (i.e. how big an area in the NRM region does that species occupy, and so what are the sorts of actions required, and scale, to support that species). We sent this data on to the NRMs we work with, and we’re currently working through other criteria for these same NRM regions, including Threatened Ecological Communities, World Heritage Areas, Ramsar Wetlands, and a whole range of other analyses as well – which is really great fun, but also very important work! There are a heap of other analyses we’re also looking at individually for the NRM regions we support as well (for example – did you know that the Rangelands NRM region makes up 28% of the Australian continent?). 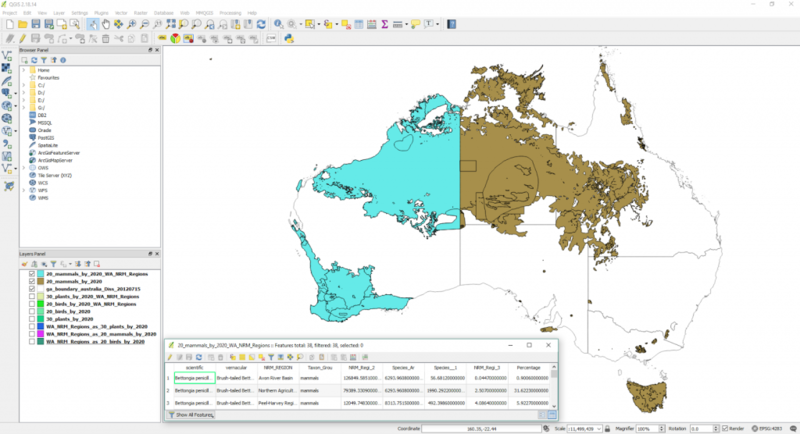 Another of the ways we’re supporting the groups is through our ongoing spatial support and the ongoing use of GRID, our easy-to-use online GIS built for (and by) the NRM community. GRID came into being when we started working with the South West Catchments Council (SWCC) on replacing a very complex spatial software stack – which was overkill for their requirements, and had a significant ongoing operational cost via licensing (along with a lot of licensed desktop software). The higher ongoing costs were factored into how we would implement a solution for SWCC – we needed something with minimal ongoing cost – so open source libraries were used throughout our initial builds. Once we had the system set up for SWCC we jointly decided to make it available for other NRM groups and to seek consensus and collaboration as ways forward in developing it, and we partner that with the open source QGIS package to help provide desktop tools. Providing spatial support in various ways, the most popular being in discounted pre-paid ‘blocks’ of 40 hours, to be used by the NRM however they feel the need to. That includes preparing datasets, working on other spatial projects, or creating new maps for an upcoming event or report – and these ‘blocks’ often last NRM groups for months. This approach means that the cost of running spatial services across an organisation on an ongoing basis can be well under $20,000 a year, which in many organisations is much less than the amount they spend on licences, let alone staff, office and other costs. Interestingly, our experience in Western Australia with this is that it doesn’t erode the spatial positions within organisations, but frees them up to undertake more valuable spatial work. So we see the spatial staff actually doing deeper analysis projects, and streamlining processes, rather than creating maps (which other NRM staff can now do themselves). Our work with the NRM community has been really rewarding, and certainly trying to gain input and consensus for our GRID product has been helped by the NRM groups willingness to collaborate from day one. The support from the state government NRM body has also been key – we’ve been able to run our ‘GRID road map’ workshops for GRID at conferences (such as last year’s one), and this alone has been a major source of encouragement. In these “interesting” times it certainly feels like our long-term hard work on GRID and other projects with the NRM community is really starting to deliver big benefits in the new reality of funding that they face. If you are interested in what GRID could do for your organisation, or how we could help you deliver a high value proposal to the Regional Land Partnerships, then get in touch with either myself or Chris Roach via email, or in our Perth office (08 92277309). « A better deal for NRM data!